Traveling to the Amalfi Coast from Naples looks, on paper, like quite an easy journey by public transport. But when we made the journey earlier this year, we were met with a few surprises. Here’s some tips on what you can expect if you’re planning on making a similar trip. There are a number of transport options from Naples International Airport to the Amalfi Coast. The easiest, but most expensive option, is to hire a private car to take you to your destination. This will be the easiest option by far, but will cost you €100 or more for a one way transfer. 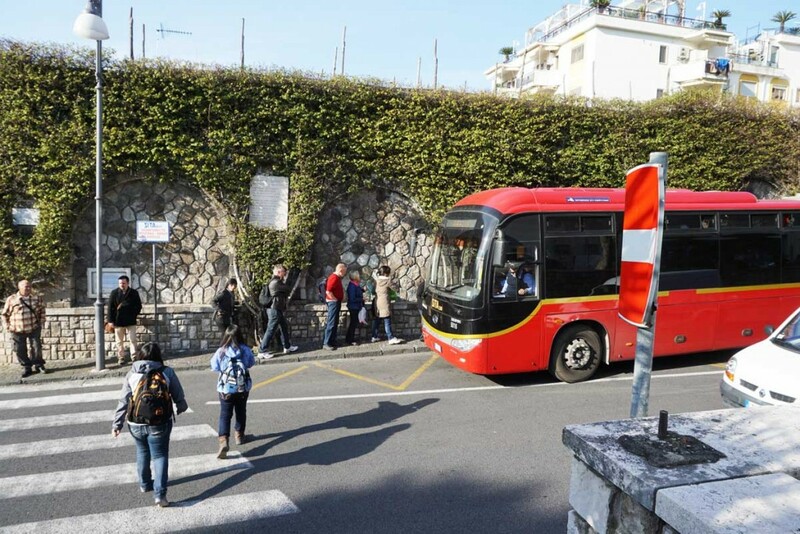 If you are traveling to Sorrento, you can also catch the Curreri Viaggi bus from the airport. To find this coach, exit the airport and walk to the right of the round-about in the parking lot. You’ll buy your ticket from the driver on the bus and the bus departs every one to two hours. There are no seat reservations for this trip and your luggage will be stored in a hold under the passenger cabin. For our journey, we decided to opt for the cheapest option and take public transport. This option is more time consuming and requires a few transfers, but was ultimately worth it, not only wanted to keep our costs low, but because we wanted to incorporate a trip to Pompeii into our travels. We had originally considered visiting Pompeii on a separate day-trip, as it doesn’t look very far from the Amalfi Coast, but after some consideration we decided to minimize our overall travel time during the trip, by incorporating our visit while en-route to the hotel. This turned out to be one of the best decisions we could have made. When you look on the map, the distance between Pompeii and Positano looks small, but the winding coast line means the trip will actually take you a few hours. Fortunately, the train you take to reach the Amalfi Coast also stops directly outside of the entrance for Pompeii. And conveniently, there are also lockers you can hire to place your heavy luggage into while visiting the historical site. This makes it really easy to visit Pompeii while en-route to the Amalfi Coast (or when returning to Naples) but more on that later. Anyways, back to the matter at hand, getting from Naples International Airport to Positano by public transport. The first thing you’ll need to do is to get to the train station, which is in the heart of Naples. The most economical way to get there is by catching the airport shuttle bus. To do this, exit the airport (it’s a small airport so simply follow the signs towards the exit) and walk across the car-park and up the left-side of the street until you see a McDonalds. The walk will take you no more than a couple of minutes and the area comprises of a small airport car-park and several regional roads. Unfortunately, the signage for the shuttle bus is almost non-existent. So your best bet is simply to make your way to the McDonalds, where you’ll then see a sign for the shuttle bus. A one-way ticket into Naples costs €4 per person (as of March 2015). You can buy the ticket from the driver using euros. After purchasing your ticket, you’ll need to get the ticket validated by a ticket machine inside of the bus. This is an important step as if you fail to do so you are deemed to be riding without a ticket and can be fined. This is because once purchased these tickets can be used on future bus-rides, so simply being in possession of a ticket does not qualify as having purchased a ticket. Your ticket must be validated – you’ve been warned! The bus will take you into the heart of Naples and drop you off approximately 50 metres from the train station. When you exit the bus, turn right and walk down the street to reach the train station. When you enter Naples Central Train Station, you’ll notice there are a number of ticket centres where you can buy train tickets. These ticket offices sell tickets for the national trains though and you’ll be looking to buy a ticket for the regional Circumsuvia train. To find the ticket office for the Circumsuiva train-line, you’ll need to make your way downstairs. Turn left down the hallway and follow the corridor for a few minutes where you should find a small, dingy looking ticket desk for the Circumsiva train line. If, like us, you’re also planning on stopping at Pompeii en-route to your final destination on the Amalfi Coast, you’ll need to buy two tickets at this desk – a ticket to the Pompeii Scavi station for €2.60 (as of March 2015), and a second ticket from Pompeii to Sorrento for €2.20 (as of March 2015). A quick note on the Circumsuvia train; this is a regional train which makes a lot of stops along the journey. Expect the train to be packed with people, many of whom are traveling between local towns. It’s also not uncommon for buskers to enter and exit the train looking for money in exchange for singing a song (or stopping the singing and going away). With all of this coming and going throughout the journey, it’s extremely important that you keep an eye on your personal belongings. The Pompeii Scavi station is positioned right outside of the historical site of Pompeii making it very easy and convenient to find. Right by the train platform is a café where you can buy sandwiches or a warm meal, a souvenir shop, as well as public toilets (like most tourist sites in Europe, you’ll need small change in order to use them) and a guarded area where you can leave your luggage for the day. The cost for this service, as of March 2015, was €3.00 per suitcase and the bags can be stored until 6 p.m.
You’ll find the Pompeii tourism office above the train station; here you can hire audio guides, tour books or join in a group or private tour of the grounds. 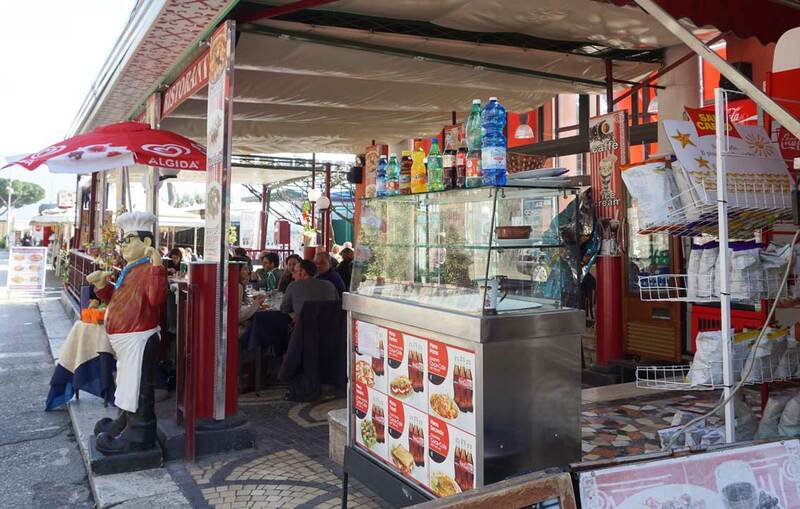 This cafe is attached to the Pompeii train station. It’s possible to buy hot and cold food and snacks here. After your visit to Pompeii, collect any luggage from the lockers and return to the train platform to catch the Circumsuvia train towards Sorrento. Once you arrive in Sorrento, you’ll need to continue your journey along the Amalfi Coast on a red SITA bus. 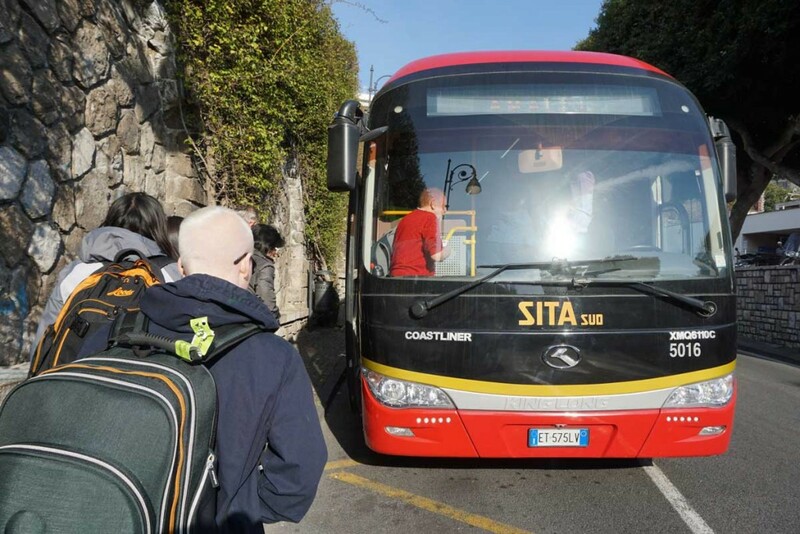 On your arrival in Sorrento, depart the train station and buy a bus ticket for the SITA bus at the convenience store attached to the station (at the bottom of the stairs on the left-hand side). The bus will park on the street across from the train station. You’ll have to cross the street and pass an island in the middle of the road. The bus stop will to the right of the crossing. A ticket from Sorrento to Positano will cost you €1.80 and will take about an hour (depending on how bad the traffic is in Sorrento and how long it takes to get out of the city!). The journey on this part of the trip is spectacular. It is certainly possible to hire a car and drive to your hotel, but the roads wind around the coastline making it a tricky drive for an accustomed driver. Instead, we really enjoyed the beautiful scenery from the comfort of the bus. After all, just look at that coastline! 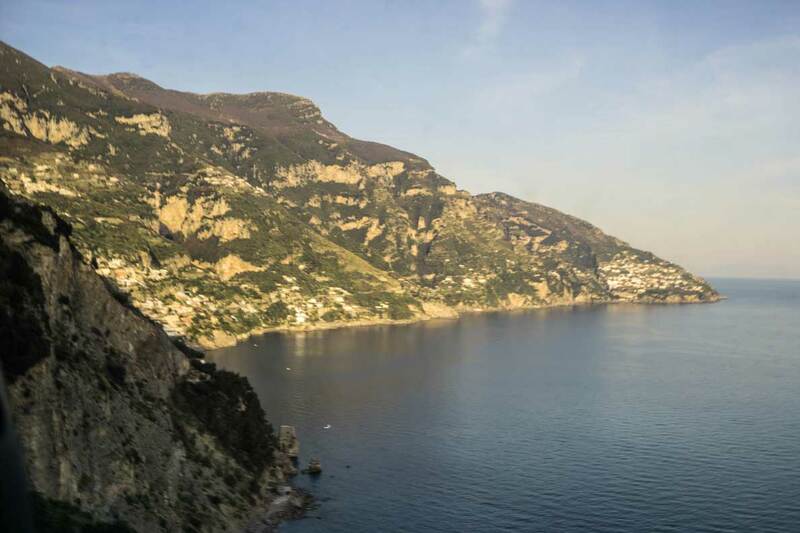 The Amalfi Coast as photographed while on the bus towards Positano. Your hotel should be able to help you identify the best stop to get off at for your hotel. It’s likely you’ll still need to carry your luggage up and down the rugged coastline until you reach your hotel, so make sure you’re wearing comfortable footwear. The Amalfi Coast has beautiful scenery, but it also requires that people can walk up and down steep hills. So if anyone in your party has mobility issues, then it may be worth hiring a car or taxi for part/all of the journey. 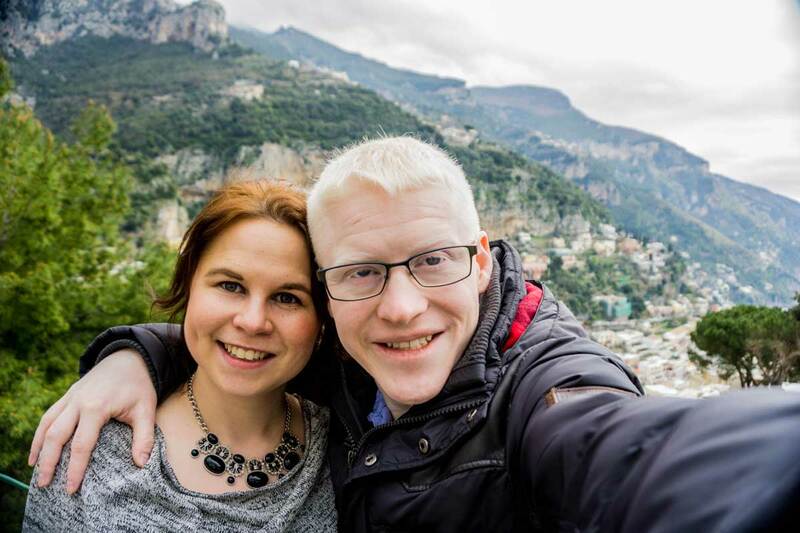 Despite this, there’s no question that the Amalfi Coast is a fantastic destination for a holiday and well worth the trek on public transport to get there. Enjoy your trip!